Esperanto is a language created in 1887 by L. Zamenhof. Zamenhof was upset at seeing people fighting because they spoke different languages and couldn't understand each other. 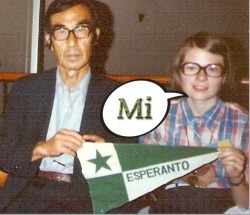 The word Esperanto means in Esperanto "the one who hopes". The ultimate aim would be that everyone speaks at least 2 languages, the language of the country they live in and Esperanto. 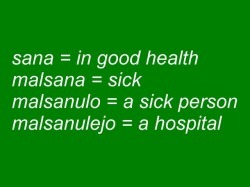 What are the advantages of Esperanto? First, it is much easier to learn than other languages. The grammar is very regular, the spelling is phonetic. Esperanto makes a wide use of suffixes and prefixes to reduce considerably the number of words that have to be memorised. It is nevertheless a real language, enabling to express anything. There are even Esperanto poets. Secondly , it doesn't belong to a nation and can therefore be considered as a neutral language. Nowadays English speakers have an unfair advantage over people who don't have English as a mother tongue. Most people who have grown up in an English-speaking country don't realise how difficult and time-consuming it is for foreigners to learn English. 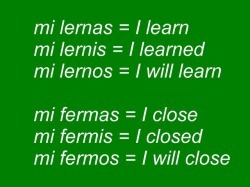 Esperanto is based upon simple rules that don't have exceptions. Some people in many different countries. There is a great variety of people interested in Esperanto, not just linguists, but lawyers, farmers, factory workers, teachers, etc, people who are gifted for languages and speak several languages, people who are not gifted for languages and found that thanks to Esperanto they can become bilingual and of course all the people in between. It is hard to know exactly how many Esperanto speakers there are, up to 2 million according to some sources. In Australia the most famous Esperanto speaker was probably Ralph Harry who worked as an ambassador in many countries. Some people learn Esperanto as a child, some as teenagers and some start learning it when they retire. There are a few native Esperanto speakers, but they are rare. It happens usually when young couples met at an Esperanto gathering and Esperanto is their only common language and therefore their children hear Esperanto from birth.